Market Research: 5 Learnings on conducting customer surveys! Thanks to my summer internship at a food FMCG Major, I have been spending a cosiderable amount of time observing how people shop – especially – food and grocery-shopping. I have been surveying / observing consumer behaviour – trying to ‘catch people in the act.’ My activities have taken me to grocery stores, covinience stores and retail chains in malls – stores like BIG Bazaar, Spencer’s, etc. 1. 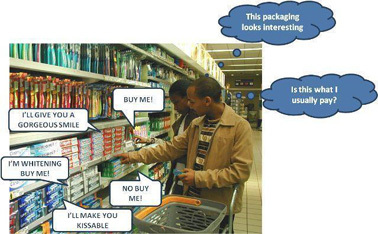 In Large Retail Chains / Supermarkets, do NOT interrupt a customer while the person is in the middle of shopping. Typically, I have observed that the best time to ‘interrupt’ would be when the shopper is shiting from one section to the other. 3. Many families tend to shop together (especially on weekends) – in such cases, if (like me!) you are male and have to interview housewives on their cooking habits, start speaking to the husband / kids and then (conviniently get redirected) to their wives / moms. This works better than asking the woman of the family – she would generally not tend to respond if they’re shopping with family. 4. The ONE difference between shoppers at groceries and shoppers at malls is this: Generally families / couples tend to shop at a retail chain / mall, while an individual woman / along with a kid would be seen shopping at a grocery. 5. Try and conduct surveys before 7.30 PM – as the clock strikes 8, people generally tend to hurry up and are reluctant to spend even a minute answering questions! I think that ultimately you need to be a bit more methodical than this; for instance, intercepting people as they leave, or as they are in line at the checkout. People will give different responses depending on small details like that. @ Richard: Very true – and thanks for sharing your insight.. I have realized this too.